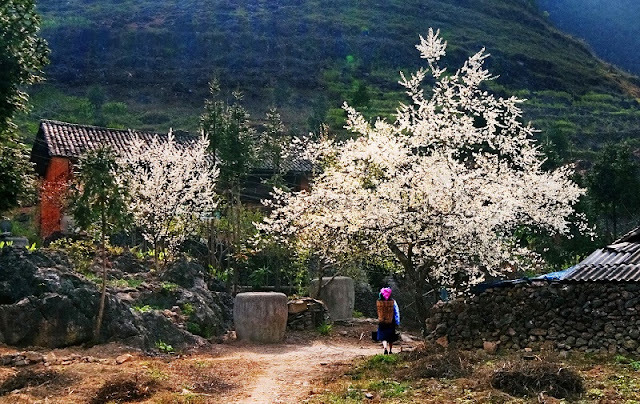 The mountains in the north are not only beautiful by winding majestic boulevards, the rivers lurking under the winding mountains and but also by the beautiful highlands in the flower season or charming terraced fields. This article will summarize "the most" of Northern Vietnam landscape, together us to explore right now! Bac Ha Plateau, also known as the White Plateau, is located between the two provinces of Lao Cai and Ha Giang with the area stretching to the districts of Bac Ha, Si Ma Cai, Xin Man and Hoang Su Phi. The plateau has an average elevation of 1,000 meters, the highest peak is Kieu Lieu Ti. Like Dong Van, the Bac Ha plateau is a limestone plateau, famous for the Bac Ha plum cultivated by mountainous people. There are also many cultural features, in which, the most highlighting is the colorful Bac Ha fair. The fair with a full range of products of mountainous people is also an interesting point that visitors in Vietnam Package Tours should not miss when they have the opportunity to come here. If you would like to enjoy fresh air and peace, it is excellent to visit the most beautiful highlands of Vietnam. The alluring highlands in the north of Vienam will be the places where you have a memorable trip. Dong Van Plateau is considered as the best destination in Vietnam for people who are “fans” of backpacking tourism. Dong Van Plateau lies at an average elevation of 1,000-1,600 m above sea level. Dong Van is one of the most beautiful highlands in Vietnam with 80% of limestone area and numerous fossils dating back 400-600 million years, so this place is very useful in archeological research. Located 132 km from Ha Giang town, Dong Van stone plateau is in 4 districts of Quan Ba, Yen Minh, Dong Van and Meo Vac. Dong Van is attractive by the endless green of limestone mountains, and countless rare fossils dating from 400 to 600 million years. Besides, this place is also famous for a diversity of unique cultural identity as there are 17 ethnic minorities living here. 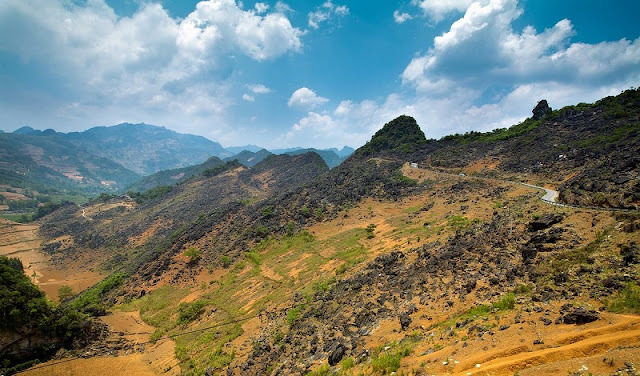 With majestic mountains, the beautiful blooming flowers fields, the vast terraced fields, … Dong Van limestone plateau is the unique scenery in Vietnam, bearing the imprint of the history of the formation and development of the earth’s crust. Be sure to prepare your camera carefully before coming here for you will be impressed by the majestic beauty of Dong Van and would not like to miss out any angle shot. Mu Cang Chai is a western district of the Yen Bai province in Northern Vietnam. Mu Cang Chai is famous for its terraced fields. The terraced fields here are mostly located in three towns: La Pan Tan, Che Cu Nha and Ze Xu Phinh. These three towns were ranked as National Famous Landscapes. 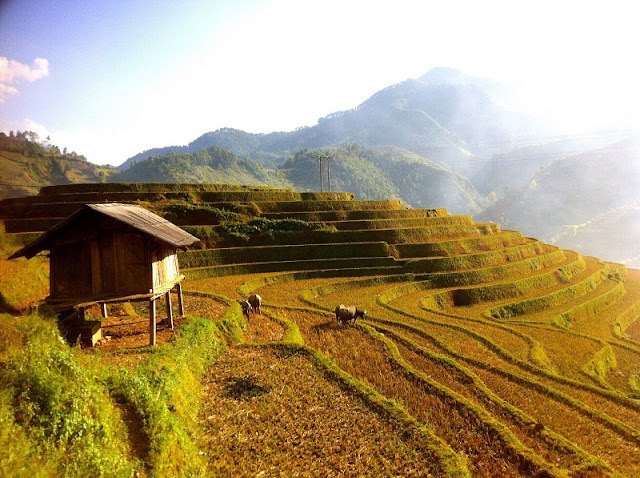 The harvest season in Mu Cang Chai is from September to October, so you should visit the area this time to enjoy the fanciful scenery of terraced fields. Indeed, the all-yellow hillsides of ripe rice seedlings, circling around the terraces - all of these things make up a dreamy beauty; enchanting, romantic and serene. This is a very distinguishing beauty; generous for all visitors, but only during the special Mu Cang Chai harvest season. These appear and disappear alternately with the small houses of the ethnic people, which stretches to the top of mountain. Moc Chau plateau of Moc Chau district, Son La province, is over 1000m high above sea level. Moc Chau is about 200 km from Hanoi. It is one of the most popular destinations for tourists of Mai Chau 2 Days 1 Night because of fresh air and cool weather all year round. Coming to Moc Chau at any time of the year, you can also enjoy the flower fields stretching endlessly. Each season holds different beauty depending on the season of each blooming flowers, so you have to visit Moc Chau many times to discover all the natural beauty of mountains and forests in the Northwest. In addition to admiring the natural beauty of the mountains, visitors also enjoy the specialties of mountainous ethnic people such as calves meat, stream fish, buffalo meat, taro, … If you eat only once you will remember forever.